In light of growing terror, Singer said, the WJC developed a comprehensive security program at the request of its communities, focused on researching threats, assisting in crisis management, laying physical security infrastructure, and advocating for increased local security support. Since its establishment in 2015, the WJC’s Security and Crisis Center World has operated in dozens of countries across the globe. “The WJC does not seek to duplicate or replace the role of law enforcement authorities. We do, however, strive to raise awareness of particular threats facing Jewish communities, to enhance and support the efforts of governments and local authorities to provide security, and to facilitate cooperation between them and the communities,” Singer explained. 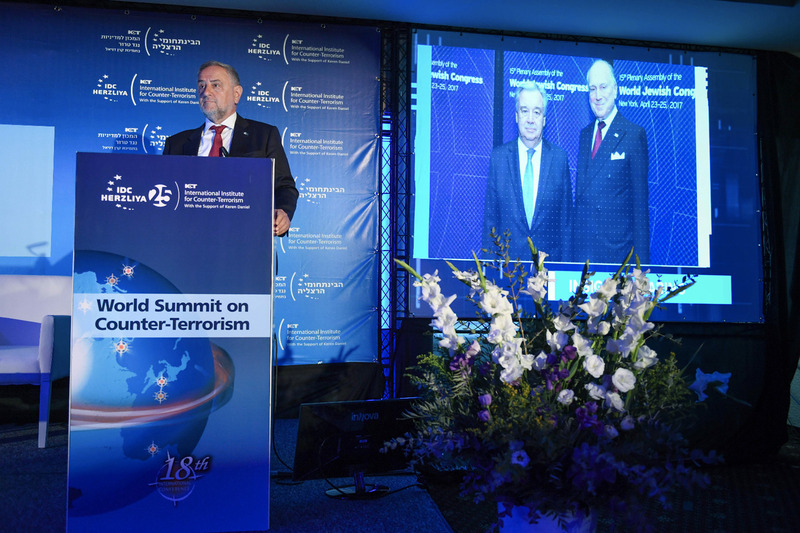 The World Summit on Counter-Terrorism takes places September 3-6, under the auspices of the Inter-Disciplinary Center of Herzliya’s International Institute for Counter-Terrorism, which operates with the support of WJC President Ronald S. Lauder. Delegates to the conference were to be addressed by high-profile security experts, government officials, and international figures, among them former Mossad Chief Shabtai Shavit, Director of the UN Office of Counter-Terrorism Dr. Jehangir Khan, and NATO Assistant Secretary General for Intelligence and Security Arndt von Loringhoven, inter alia.